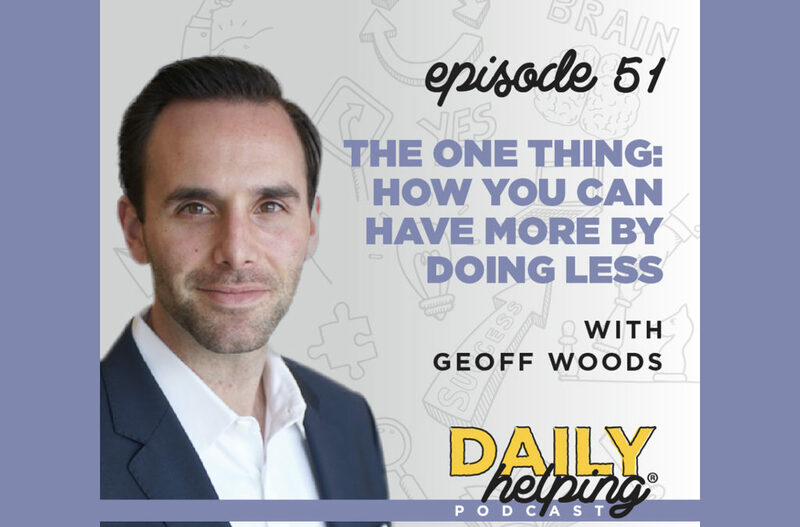 Today our expert guest is Geoff Woods, the Vice President of The ONE Thing, whose mission is to teach people how to live a life of focus so that they can have more by doing less. But this wasn’t always Geoff’s mission. He used to be working hard in medical device sales, experiencing a lot of success and providing an amazing lifestyle for his family… but it felt like something was missing. Then, in quick succession, Geoff’s young co-worker died and his pay was cut 40 percent. He started hemorrhaging cash, and it was a huge wake-up call. That’s when Geoff saw a Jim Rohn quote that changed his life: “You are the average of the five people you spend the most time with.” After hearing that, he set out on a mission to surround himself with high-level CEOs and successful entrepreneurs. Fast forward just 10 months, Geoff went from employee to entrepreneur, launching a company with the co-authors of the bestselling book The ONE Thing, Gary Keller and Jay Papasan. It’s here that Geoff found clarity around his new mission, and fulfillment. How can we have more by doing less? The ONE Thing is all about “the surprisingly simple truth behind extraordinary results,” which ultimately comes down to how you use and invest your time. Because, every morning, there are innumerable things you COULD do – but there are really a very small number of things you SHOULD do to create results, in any area of your life. Most people waste a tremendous amount of time, every single day, and then feel like they don’t have enough time to do what they want to do. The truth is that we all have the time to do what’s most important to us, but we’re not all investing it correctly. To figure out what you should be doing, The ONE Thing teaches readers to use a focusing question: What’s the one thing you can do, such that by doing it, would make everything else easier or unnecessary? Not a list of things – ONE thing. But after you have that figured out, you’re not done. You still have to do your ONE thing, every day. Meaning you have to protect time for it, every day. That’s when time blocking comes in, or the practice of actively scheduling time on your calendar to do your most important work (while saying no to everything else). Until your ONE thing is done, everything else is a distraction. “Think BIG in terms of your vision, think BIG in terms of your goals, think BIG in terms of your standards for yourself, and then go really small. The mistake people make is that they think big and then they try to act big; they set big goals, and then they try to do a million different things. “Instead of casting a big vision, casting big goals, and then going really small by identifying the ONE thing that they can do, such that by doing it, will make achieving that big goal easier or unnecessary. And it’s not that they only do that one thing – it’s that they do it FIRST.